The Israel Defense Forces boosted its presence on the Syrian border in anticipation of protests following U.S. President Donald Trump’s intention to recognize Israeli sovereignty over the Golan. Israeli Prime Minister Benjamin Netanyahu and Security Cabinet members get a tour with the North Front Command in the Golan Heights on Feb. 6, 2018. Credit: Kobi Gideon/GPO. (March 24, 2019 / JNS) The Israel Defense Forces has increased its presence at the Syrian border in anticipation of protests following U.S. President Donald Trump’s announcement of his intention to recognize Israeli sovereignty over the Golan Heights. “The IDF and Israel Police are preparing for the possibility of tension in the northern Golan Heights on both sides of the border,” the IDF said on Saturday. Reports indicate that preparations include the positioning of snipers along the northern Golan and the deployment of riot control equipment, such as tear gas and rubber bullets. 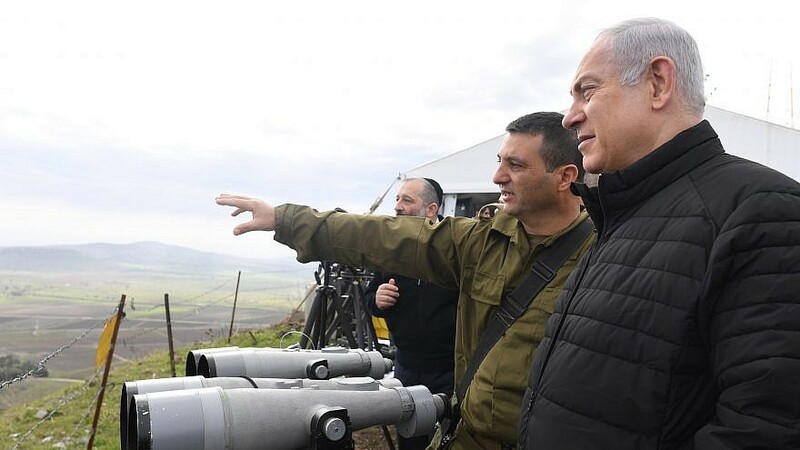 Recent reports indicate that Trump’s administration is preparing an official document recognizing Israeli control over the Golan to be signed during a meeting with Israeli Prime Minister Benjamin Netanyahu on Monday. After Syria attacked Israel during the 1967 Six-Day War, Israel conquered and took control of the Golan Heights, which are considered to be part of the ancient Land of Israel upon which much of the State of Israel is currently situated. The Jewish state officially annexed the Golan in 1981 and has maintained a buffer zone with Syria since the 1973 Yom Kippur War. Some of the Golan’s 20,000 Druze residents serve in the IDF and maintain loyalty to the State of Israel. However, others believe in Syria’s right to the Golan and even have Syrian citizenship.